ST. PETERSBURG, Fla. — It was a good catch, excellent even. J.D. Drew had to vault over a pitcher’s mound in the Rays’ bullpen, contend with chairs, the wall, and scattering relief pitchers, and he still caught the ball. Except, he shouldn’t have caught it. With one out in the seventh inning and the Sox leading, 1-0, Carlos Pena stood on third base as Matt Joyce lofted a ball into foul territory down the line in right. It drifted to the right, far to the right, and came down amid the chaos of the home bullpen. And that was what he should have done, at least according to a few Sox players after they lost last night’s game, 3-2, to the Rays in 10 innings, courtesy of a home run by Dan Johnson. Drew said he should have pulled up, should have done anything except stick out his glove and make the grab. It was a good catch, but a bad decision, as Pena came in to score on the sacrifice fly to tie the game. In fact, Drew’s still not sure how it happened, even going so far to say that he nearly stopped running. So why didn’t he stop? And why did he catch it? “I don’t really know how in the world I caught it,’’ Drew said. “That’s kind of amazing to me. If I tried to make that play in a situation with two outs and the game on the line, I probably would never be able to get to it. For some reason, that thing stuck in my glove. I had every intention of letting it drop. Just instinct, you know. Put the glove out right at the last second as I saw the ball coming down, and it ended up in there. It’s kind of beyond me. That wasn’t the only mistake the Sox made in the inning. Pena was only on third base because of a two-base error by Clay Buchholz. After Pena reached on a fielder’s choice, Buchholz threw over, seemingly a strange decision given that Pena is hardly a threat to run. But the choice to throw over was not Buchholz’s. Bench coach DeMarlo Hale said the Sox didn’t want Pena to get any kind of lead with just a one-run advantage. So they tried to keep him close — and instead, he ended up on third. “I just threw it away,’’ Buchholz said. “I’ve done it 1,000 times. I tried to get it over there a little too quick, and he wasn’t as far off as I thought he was. The throw went past first baseman Mike Lowell and deep into foul territory. Pena moved up two bases, setting up the foul ball from Joyce and the first run of the game for the Rays. The next inning, though, brought a moment of light for the Sox. Just as Victor Martinez came to the rescue of Jon Lester Friday night, he seemed to come to the rescue of Buchholz last night, launching his third home run in two games out to right field for this 13th of the year, making it 2-1. But Buchholz came back out for the eighth. And on the second pitch of the inning, B.J. Upton brought the teams back into a tie, lifting a home run out to left field. The game remained that way until the 10th inning, when Johnson waited until the eighth pitch of the at-bat against Scott Atchison to end it, homering to right field. It was not the first time Johnson had crushed the Sox. 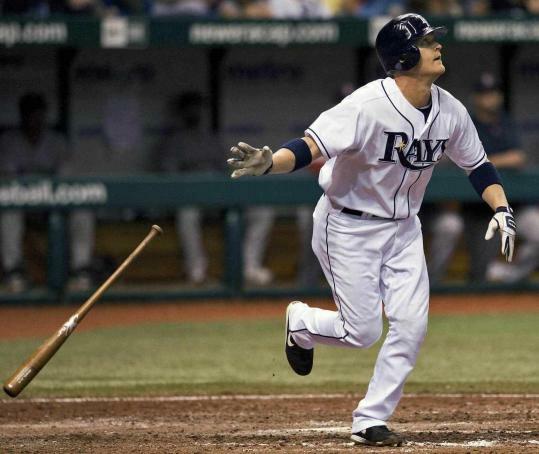 He had a game-tying, pinch homer off Jonathan Papelbon Sept. 9, 2008, at Fenway Park that led to a Rays victory. It was a disappointing end to an excellent outing for Buchholz, one in which he lowered his ERA to 2.21, even as he ended his scoreless innings streak at 26. That was the most for a Sox pitcher since Pedro Martinez threw 35 straight scoreless innings in 2002. That was because the Sox had done little against Rays starter Matt Garza. Boston scored one run in the fourth, when Martinez led off with a single, went to third on a David Ortiz double, and came home on an Adrian Beltre sacrifice fly. They got their other run on Martinez’s home run off Joaquin Benoit. It wasn’t enough. And so the Sox are back where they started the weekend, standing six games out in the loss column in both the division and the wild card. That sets up a nearly must-win game tonight, as the Sox try to stay in the race.